The Tennessee Titans have had a dismal start to this season, currently starting at 0-6. The time has come to make a change. Do I blame Collins for being a bad QB? No, I most certainly do not. Collins has served this team well over the past couple years, and I do not feel that Collins lost those six games single handed. Collins is a consistent QB that is more than capable of getting the job done. Sometimes that is not enough. Vince Young, although less of a consistent QB than Collins, has a playmaker ability that Collins has never displayed, and this playmaker ability has the potential to ignite the spark in every player on his team, both offense and defense. This is what the Titans need right now to get back on the path to victory. Will it happen? Only time will tell. 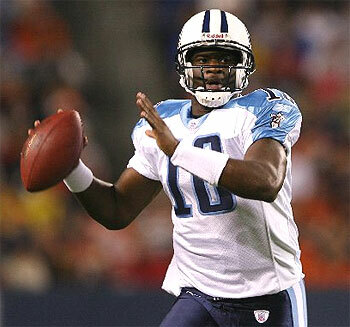 I certainly hope we see the potential unleashed when VY takes the reigns of the 2009 Titans this Sunday.